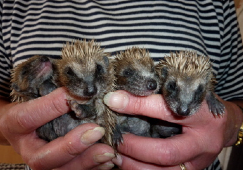 Here you’ll find photos and stories about some of the hedgehogs we have rescued. These four babies (hence the name, John, Paul, George & Ringo) were found by a lady gardening when she discovered them in their nest under shrubbery, but with no sign of their mum. She waited to see if mum would come back, as the babies were calling for her, but mum never returned, so she brought them to us in their nest. They were very small (average weight 25g) and they were cold and hungry – at this young age they look a bit like toothbrush heads as their spines are white and quite flexible. They were immediately placed on a heat pad indoors and fed every 2 hours (24 hours a day) with a milk substitute. Thankfully, they survived and eventually went free. It is always touch and go when they are so young and have been left for so long. 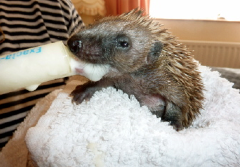 This is Shrub, a tiny baby abandoned by his mum when a garden shed was dismantled. She moved all his brothers and sisters, but sadly not Shrub. He arrived at Spikes wrapped in a little piece of towel within an Indian take away container. 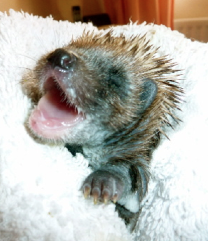 Again, he was cold and hungry and weighed only 20g. His chances of survival were poor as he had been left for over 36 hours on his own. Again, he came indoors with me on a heat pad, fed every 2 hours and he grew up to be a lovely boy with a big attitude problem – wonderful. He was eventually released back into the wild. Another small baby, this one is Sprout. He was found locally on his own when someone was clearing rubbish from their garden. Sprout arrived very wet, cold and hungry and weighed just 19g. Again, the same routine of heat, 2 hourly feeds and lots of care and attention. He was released in my own garden as he could not return to where he was found as the people did not want him back! I always ‘soft release’, which involves giving them a temporary shelter as their house, food and water, and then it is their decision when they want to actually wander off. So although they are free, they are not having to fend for themselves if they do not want to. Sprout actually took 3 months before he ventured off into the big wide world! He would return to his house every day to sleep, then every evening eat his food and wander off for the night. 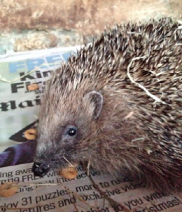 This is Anna, who arrived at Spikes with a nasty strimmer injury and had to have one of her back legs amputated. After surgery at the vets she came back to Spikes to recuperate, which involved keeping her on a heat pad, administering antibiotics and keeping the wound clean. Once healed, she was also returned to the wild.